﻿Twelve youth involved in The Legacy’s Children’s Foundation Gift of Music Programs had an amazing opportunity this week to meet Sarah McLachlan at the Jubilee Auditorium on Monday prior to her sold out show and to see her in concert with a parent on Tuesday evening. On Monday the youth were treated to a backstage tour conducted by Sarah’s road manger and were introduced to all the behind the scenes workings of a large stage production and concert. Sarah took time to personally greet each youth, pose for pictures and sign autographs. She was incredibly gracious and she sent a very powerful message to the youth about staying involved in the program, practicing and completing their education. The Tuesday concert was an incredible experience for the youth and their parents – especially after they had seen how a concert of that magnitude is put together. 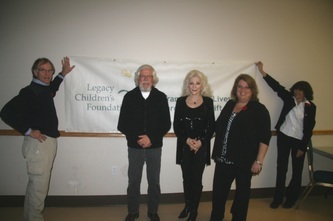 On top of all this The Legacy Gift of Music Programs received a $25,000.00 donation from Sun Life Financial to assist us with our waiting list. This experience was truly an amazing opportunity for everyone and we are thankful to Sun Life Financial for their very kind and generous donation. On February 15th The Legacy Children’s Foundation was able to provide an opportunity for youth in Calgary to take part in a one day drum workshop with Sacred Fusion’s Trevor Nugent-Smith. 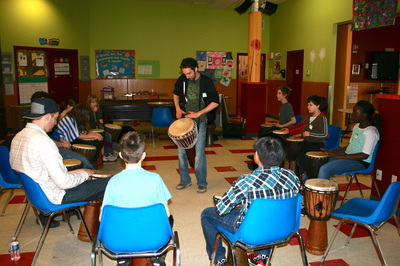 Trevor was an amazing facilitator and kept the participants engaged by teaching a short history of the drums and then encouraged participants to experiment with different rhythms and beats they can be made with boomwackers and the djembe drums. 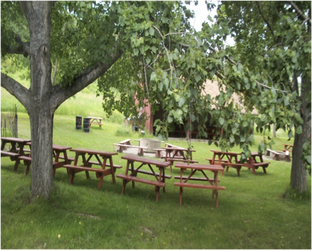 There were plenty of snacks provided graciously by Bownesian Grocer, as well as pizza for the lunch break. 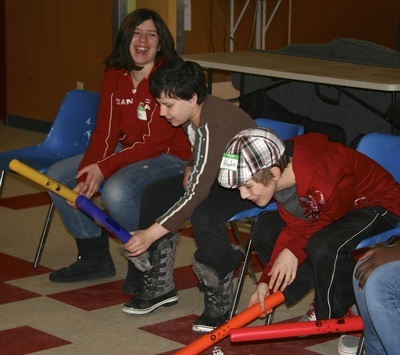 The Bowness Boys and Girls Club donated their great space for the workshop, which allowed participants to play with the games and equipment during breaks. 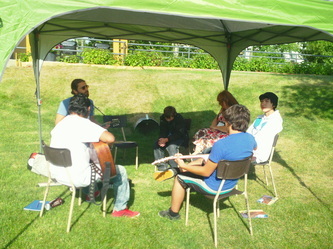 Throughout the workshop the youth continued to add to their knowledge of the instruments and compile a song as a group. This song was then recorded and made into CD’s for the participants to take home. 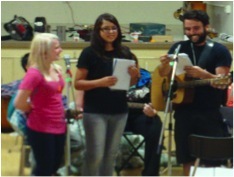 This past August The Legacy Children’s Foundation in partnership with the Boys and Girls Club of Cochrane was able to provide an opportunity for youth in Calgary and Cochrane to participate in a three day music workshop, facilitated again this year by the Tequila Mockingbird Orchestra (TMO). New this year was the overnight camping component - all components taking place at Camp Jubilee in Cochrane. 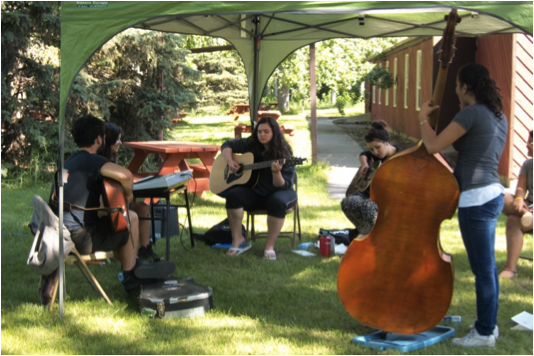 Key workshop experiences included opportunities to learn about Percussion, Studio Recording and Songwriting with lots of opportunities between sessions and around the camp fire in the evening for Jamming, Improvising and Performing. 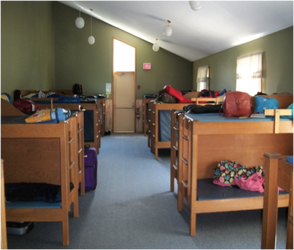 The Boys and Girls Club of Cochrane provided an awesome group of individuals to look after the daily camp activities including preparation of all meals, activities such as Capture the Flag and overnight supervision. 2 draws per day took place for the opportunity to win 6 T-shirts and 6 hats donated by Big Chief Beef Jerky. This year’s Workshop/Camp supporters included TELUS Calgary Community Board and Alberta Government Safe Communities Initiative; Big Chief Beef Jerky that also provided 3 days worth of beef jerky snacks; Canadian Tire and Safeway in Cochrane that provided gift certificates to assist with the cost of other workshop items and snacks; and Capture the Flag and McDonalds gift certificates. 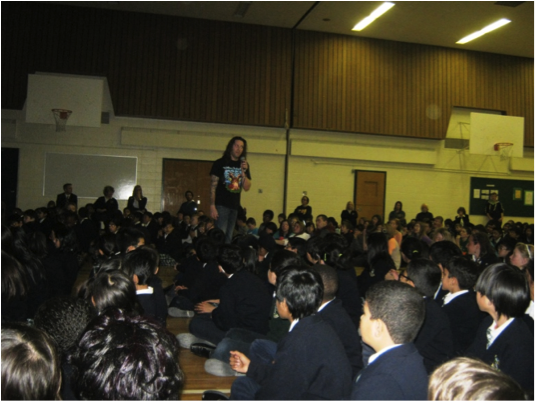 A number of Calgary Schools have been experiencing a unique ‘Rocking Inspirational Experience’ this school year through a generous $20,000 gift from the TELUS Calgary Community Board to The Legacy Children’s Foundation. In a 90 minute presentation format chosen by some schools, Troy has encouraged, engaged and empowered young people to be proactive rather than reactive by presenting his life story, as told through the perspective of Kyle...by sharing Kyle’s life and memories Troy demonstrates how young people can channel their negative energy in a manner that encourages and shows young people how to break free of past abuses and memories. 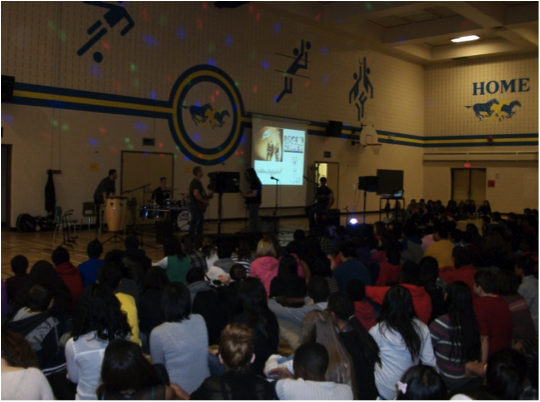 The ‘full day’ format chosen by other schools begins in the morning with Troy and his band using live music to combine the power of ‘storytelling’ in a ‘rock concert with a message’ format – using original songs that compliment the message of overcoming adversity and pain. 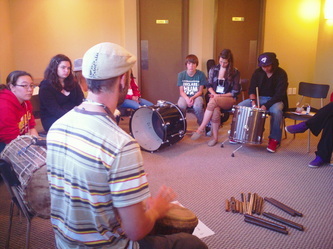 In the afternoon Troy and his band mates facilitate 3 concurrent 2½ hour workshop sessions - one focusing on Drums and Percussion, one on Guitars, and one on Singing and Songwriting. We are very excited and honoured to have been able to bring this opportunity to students in Calgary Schools. Legacy Gift of Music programs provide instruments and music lessons to deserving and qualifying youth every week with instrument drives such as this helping to replenish our instrument supply so that children and youth may benefit from the generosity of local community members. This instrument drive will be a month long event from January 31st to February 28th. 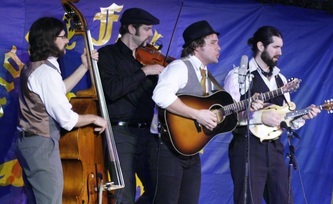 To start off the instrument drive, we will have a “Kick off Open Mic Night” on the evening of January 31. This will take place from 7:00pm to 8:30pm, at Cochrane Coffee Traders located at 114 2nd Ave West. This will be an event where we encourage musicians of all ages to come out and participate and we also welcome anyone to drop off their used instruments at this time. 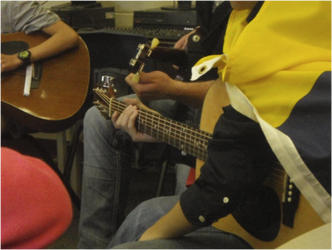 After January 31st, you can still donate your instruments at Cochrane Alliance Church, located at 902 Glenbow Drive on any week day (donations will not be accepted Saturdays and Sundays). 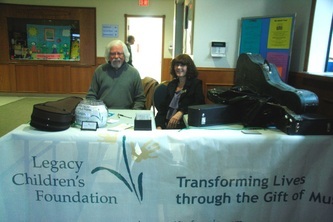 The Legacy Children's Foundation will distribute the donated instruments to the children and youth in your community. 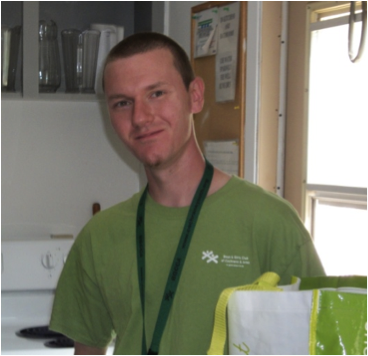 For more information call 403-969-6276 or email Marni Butler at marni@legacyfoundation.ca. Come help make this event a success! 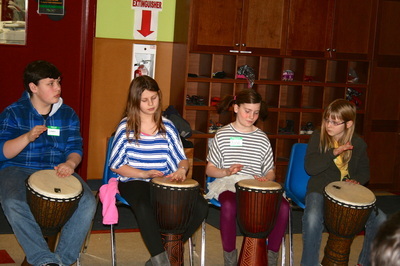 Key workshop experiences included opportunities to learn about Percussion, Studio Recording and Performance, Songwriting, Composition and Melody, Followed by final performances from all groups. Shown ordered in the images below. Workshop supporters included Alberta Government Safe Communities Initiative; Big Chief Beef Jerky that provided beef jerky snacks; Calgary Co-op Crowfoot, Westhills Towne Centre Safeway and Montgomery Safeway and Signal Hill Centre Real Canadian Superstore that provided gift certificates to assist us with the cost of other workshop snacks; and John White who helped us pay for the cost of instrument rentals. Check out the Gallery tab under Events, or click here to see more pictures from this awesome workshop! In partnership with The Rotary Club of Calgary and Bricktown Rotary Oklahoma City, Legacy was able to provide an opportunity for youth in Calgary and surrounding communities to participate in a two day music workshop. This workshop was attended by 31 youth, volunteers and staff from Legacy, as well as 12 Rotary volunteers from both Calgary and Oklahoma who provided a pancake breakfast for all in attendance each morning and participated in the workshops with the youth. Additional workshop supporters included Alberta Government Safe Communities Initiative; Big Chief Beef Jerky that provided beef jerky snacks and Calgary Co-op North Hill Centre who provided Rice Krispy Squares for afternoon snack breaks. 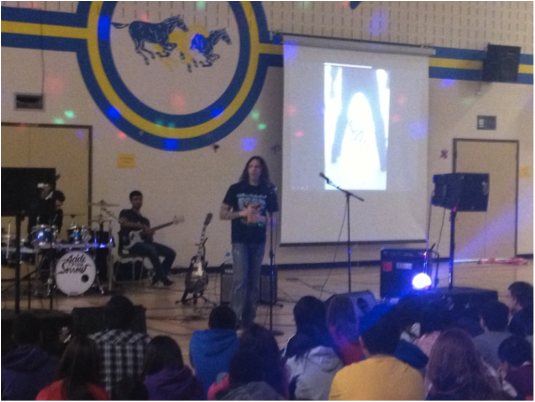 Other presenters included Astro Physicist Rob Cardinal, who talked about how he worked through adversity to become a well respected Research Associate at the University of Calgary, and #1 best-selling author Troy Payne and his inspirational music infused presentation about how Four Resiliency Based Tools put him on a positive life path. 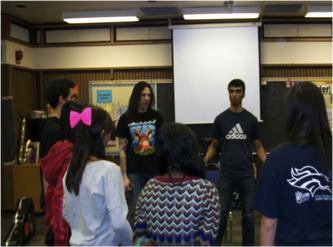 Youth were also able to jam with Troy and Jordan, one of his band members, after his presentation. A major highlight at the end of the first day was a draw for a hand-made electric guitar crafted by Jordan. Other Performers: DJ Big Worm who demonstrated his Scratching expertise with a live performance that included diverse musical styles during the lunch break on Sunday, and Chris Millar and Morgan Luchinski who also hosted an open mic session at the end of the workshop on Sunday. 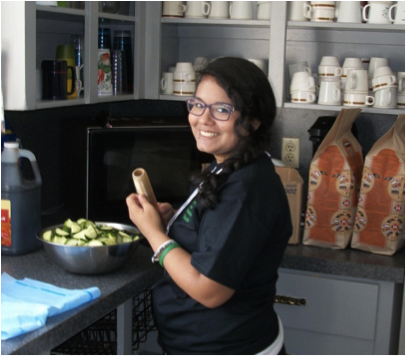 Click below to listen to the radio sweepers the youth created during their Studio sessions with KC! Pictures of the event can be found in the Gallery tab under Events or click here. 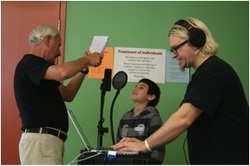 This exciting workshop opportunity involved learning the inner workings of a recording studio. The workshop was facilitated by one of Legacy’s music instructors – KC Styles – who teaches drum lessons for Legacy and has a Masters Degree in Sound Engineering. 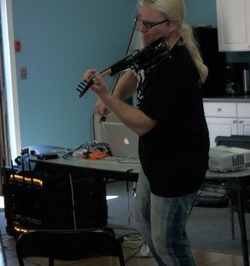 He also plays an awesome electric fiddle. The workshop was based on KC’s own experience using his mobile “Studio in a Box”, that is loaded with state-of-the-art technology, that he uses to compose for websites, television, documentaries and corporate clients. 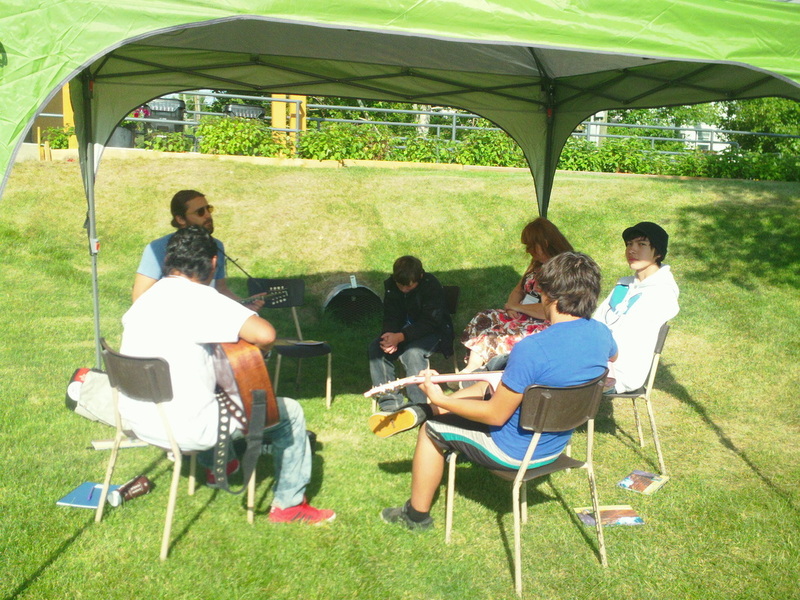 This event was a great success with fourteen (14) youth participating! They all worked as a team to create a very fun and original radio sweeper as well as the background sounds to a video game. 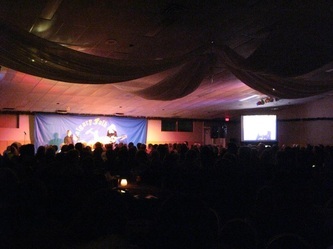 They used innovative and cutting edge techniques in order to create an accurate depiction of what it takes to create these productions. 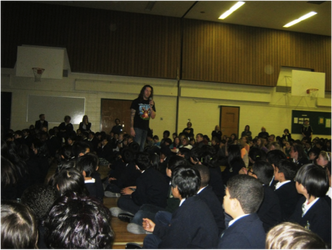 Each young person seemed to really enjoy the event! - We look forward to hosting similar workshops in the future. 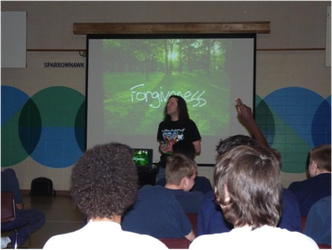 This workshop was made possible thanks to the Alberta Government Safe Communities Initiative, Bowness Boys and Girls Club who provided their facility, and Legacy’s Penny Lane ‘penny collection’ Project. We would also like to thank Bownesian Grocers who donated granola bars and bottles of water for the event and Big Chief Beef Jerky for their donation of beef jerky snacks. 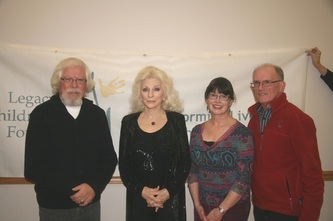 Pictures of the event can be found in the Gallery tab under Events or click here for the link! Click Below to listen to the radio sweeper! Legacy is proud to be associated with Paul Brandt’s Build it Forward Initiative and to be working closely with one of the recipient families in Cochrane who absolutely loves music and wants to give back to the community through Legacy. 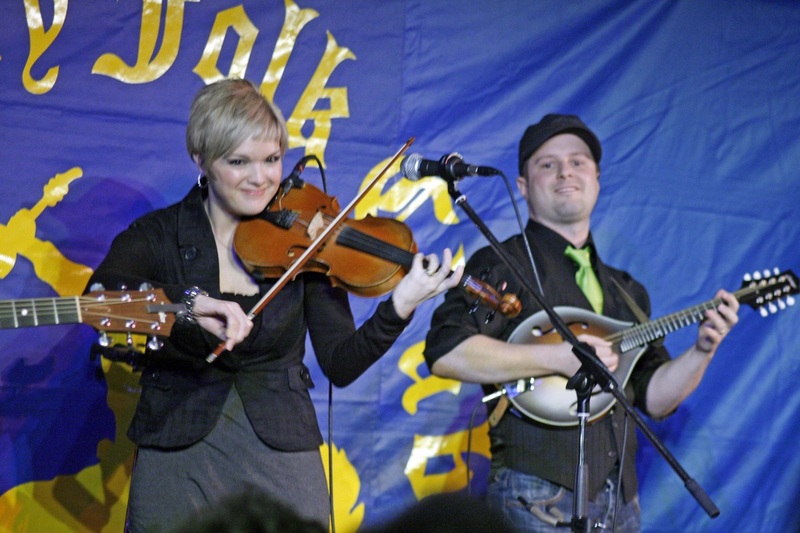 Their desire is to assist Legacy in acquiring donated instruments from the local community which will in turn be donated to local youth through our Gift of Music Program – some of the instruments donated will also be provided to a third world country. Hosted by country music star Paul Brandt, BUILD IT FORWARD is an exciting and inspirational new documentary series on CMT Canada. The biggest television initiative in CMT history, BUILD IT FORWARD is an exceptional program chronicling the emotionally challenging journey of 14 separate families who will be receiving a brand new home at no cost. Moving beyond similar home-makeover shows, BUILD IT FORWARD pushes the ‘giving back’ envelope: as the recipient family receives the goodwill and grace of donations and volunteers in the creation of their new home, so they are required to give of themselves to help build a new home for another family – this time in a third world country. Literally and figuratively, BUILD IT FORWARD takes the recipient family, and the audience along with them, beyond their current world-view and culture into a generous future that challenges political, religious and philosophical boundaries. 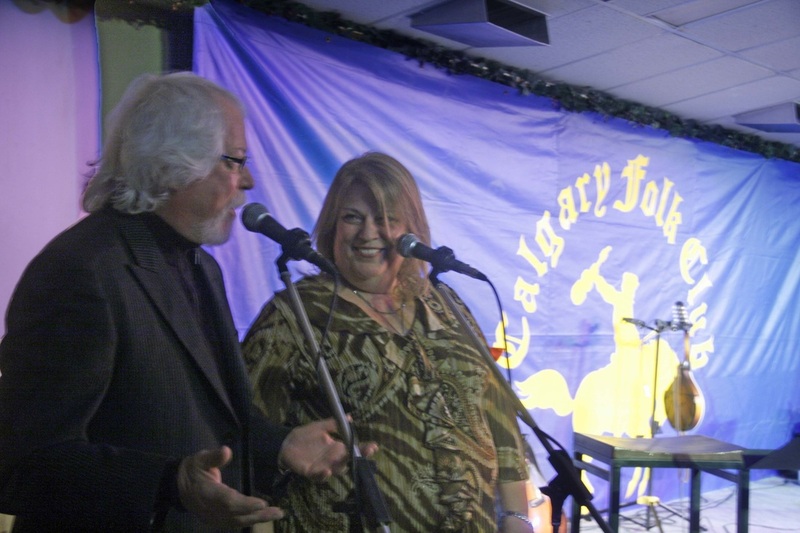 Who- Alberta Country Music Association, Ranchmans, Legacy Children's Foundation, and YOU! 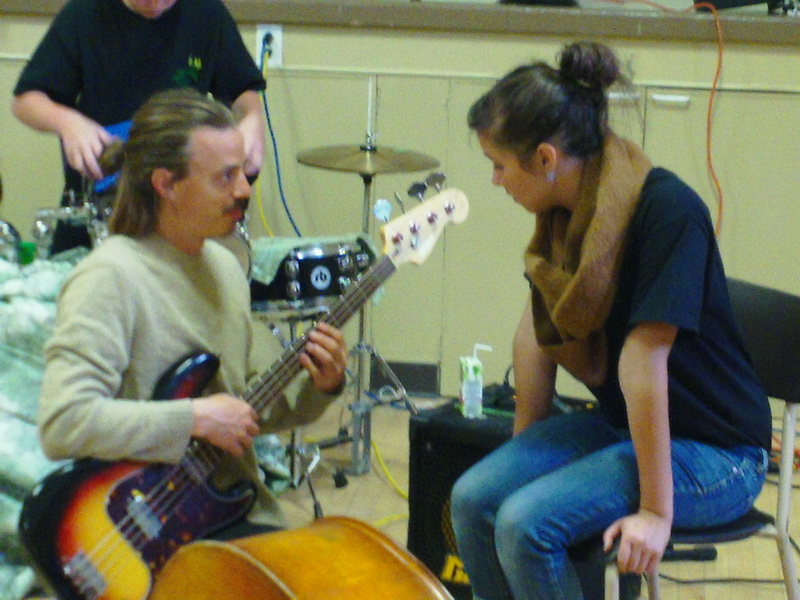 Our first annual city wide instrument drive and festival was a smashing success. Thanks to more than 40 volunteers and open mic musicians, 8 agency exhibitors and ten well polished bands from Calgary, Morley and Eden Valley Reserves and Springbank, Legacy was able to replenish its Instrument Bank with 50 instruments and we were also fortunate to have received $13,000 in donations from caring Calgarians. A special thanks goes out to Kerby Centre who donated their gym for the event and assisted with set up and clean up...as well we wish to thank our numerous sponsors who generously donated door prizes, silent auction items and drinks and snacks that helped to keep our over 300 guests energized throughout the day. 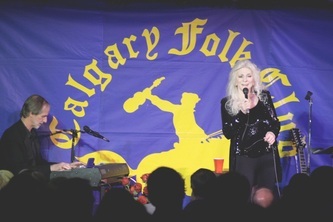 Events such as this take a tremendous amount of time and effort from dedicated folks throughout the community - the result being much needed resources for our Gift of Music Programs in Alberta and public exposure that is so necessary as many Calgarians and Albertans have never heard of our program. Please read and forward our e-newsletter to your family, friends, neighbours and colleagues. We need to get the word out about the work we are doing and the incredible impact that music is having on the lives of needy and at risk children and youth in our communities... we need everyone to know that we accept gently used instruments all year round and that we are always open to discuss the different ways that individuals, families or businesses can sponsor a child in music lessons. Thanks everyone who contributed and took part in this full day instrument drive and festive event and we look forward to “breaking the bank” next year. 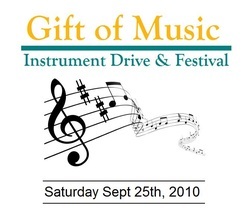 The Legacy Children's Foundation in partnership with the City of Calgary, Calgary Afterschool Initiative, is please to announce the First Annual Gift of Music Instrument Drive & Festival taking place in Calgary, Saturday Sept 25th, 2010 from 9:00am- 4:00pm at the Kerby Centre. 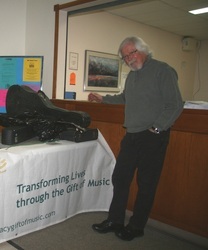 The Gift of Music Instrument Drive & Festival is designed to bring awareness and support to Legacy’s Gift of Music initiative, and their partners. 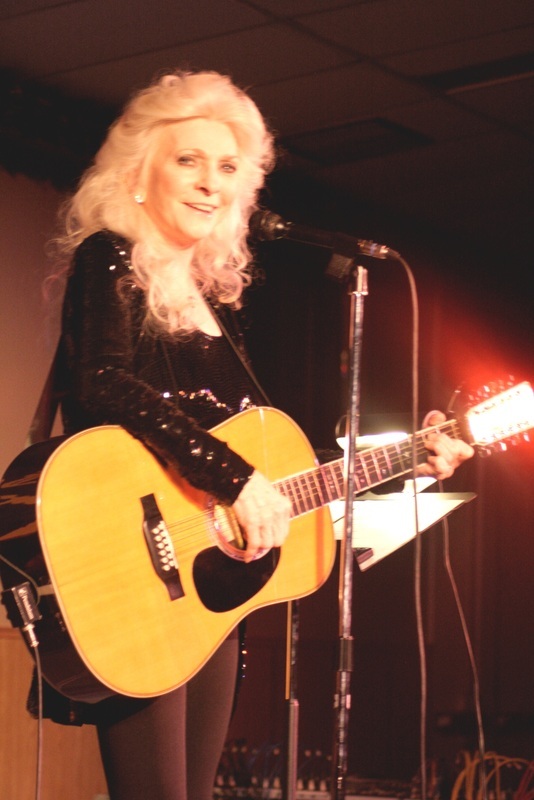 The event will host a city-wide instrument drive and fundraiser as well as provide an opportunity for Legacy-supported youth and established musicians to perform together, for the enjoyment of citizens, donors, family and friends. Throughout the year we accept new and gently used instruments at locations across Calgary. Explore music in the making during these informal and interactive mornings where you can meet musicians, see their instruments and hear their perspective on performing. Then, enter the concert hall for a special behind-the-scenes look at a rehearsal where you’ll witness the artistic skill and camaraderie that make our Orchestra world-class. 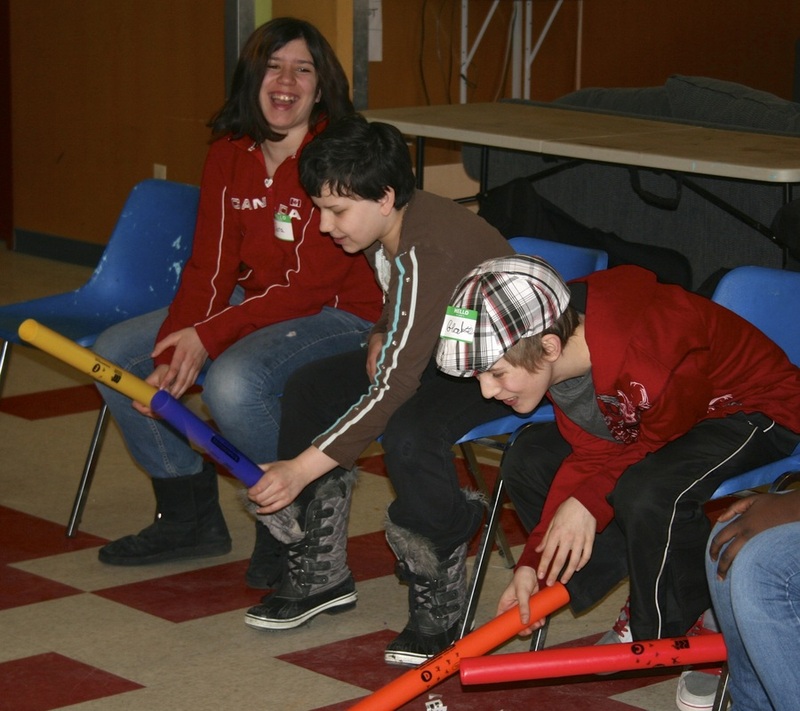 Youth at Terry Fox School have joined forces with the Kerby Seniors' Centre to assist elementary schools and other children and youth programs in their community in obtaining much needed musical instruments. The result? Legacy collected 40 instruments including one complete drum kit, a number of accessories and music books with more coming into Kerby weekly. 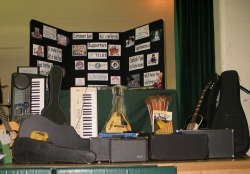 We have already found homes for 16 of the instruments and some of the accessories. Thank you everyone for your kind donations!